Becoming an adult and preparing for the future. The aim of this stage is to ensure that the family begin to prepare for the young person’s transition into adulthood and that they have clear expectations about what options and services are available and are able to make informed choices about the future. Annual School Reviews, from Year 7 to 11 which involve parents and all professionals involved with the family to look at services and support currently being provided. At these meeting support needs for the family and outcomes across all areas of the young person’s life are reviewed. Families are made aware of what services and equipment are available that can support a meaningful life for the young person so that informed choices can be made. In addition to annual reviews, transition planning starts to take place and brings together the people who will ensure that the young person and their family can plan ahead for the future as they enter adulthood. Transition planning is a person-centred process with the young person’s preference, goals and aspirations taking centre stage. The transition plan is focussed on individual needs, regardless of what those needs might be, and agreed with the young person and their family. Ensure that families are in receipt of targeted support and are aware of what is achievable and deliverable and that going forwards, the young person’s has a suite of options regarding learning, working and leisure activities and where they want to live. Reviews will be conducted with families on a regular basis, at least annually. Where relevant, every young person and their family should be helped to decide on an end of life plan and should be provided with care and support to achieve this as closely as possible. Services and support are available for young people up to the age of 25 with SEND. Further information about The Point is available in the 'related services' to your right. Support for young people with a disability or long term health needs usually transfers from children's services to adult services when a young person reaches 18. Transition is the name used for this process and can be applied particularly to social care but also health services. As a young person approaches adulthood, children services will consider whether the young person will require support once they become 18. Information about the young person will be shared with adult services and in particular the Transitions Team. The young person and their carers will receive support and possibly an assessment to assist in developing transition plans. The Transitions Team will be involved in deciding whether the young person will be eligible to receive social care support from adult services. If the young person is not eligible, the team will advise of other local services and agencies that may be able to assist. The Transitions Team consists of an Assessment Officer, an Occupational Therapist, a Learning Disability Nurse, a Greenwich Mencap Transitions Worker and a Team Co-ordinator. Transition planning is for the young person and should be about the things that are important to them. The young person must have every opportunity to communicate their needs. Education, Health and Care Plans identify the aspirations and wishes of young people with special education needs, and their families. These are crucial to ensure there is a clear plan towards achieving outcomes for the young person. Young people and their carers should be aware of the transition process throughout their involvement with special education or social care. However if you are concerned that you have not received this information, please contact the Children with Disabilities Team on 020 8921 2599. London South East Colleges provides outstanding education and training for young people with Special Educational Needs and Disabilities across two of our sites. We are particularly proud of both our employability programmes with our extensive employer network who help us to identify a range of employment opportunities for our learners with Special Education Needs and Disabilities, offering them the chance to work and develop their skills. And our Independent Living programmes that support the development of the skills of young people with more severe to complex needs need to life within the local community. Our Nido Volans Centre at Bromley provides specialist facilities and support for learners with complex to moderate learning difficulties. The learners develop both employability and independent living skills, supported by our specialist team, to prepare them for their adult life and the world of work. Our facilities at Bromley include our ‘Chefs Table’ training kitchen and restaurant, a manufacturing workshop, horticultural facilities (including a large polytunnel) and a performance space which is home to Greengoose Performing Arts - creating the perfect learning environment to develop learners’ skills. Our Nido Volans Centre at Bexley also provides brand new specialist facilities and support for learners with complex to moderate learning difficulties. The facilities at Bexley also include an accessible independent living kitchen, a manufacturing workshop, a performance space, art and enterprise, personal presentation and ICT rooms. 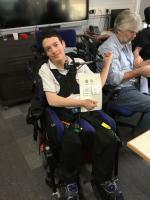 As at the Bromley centre learners develop both employability and independent living skills. Dyslexia affects at least 10% of the population it is a difficulty in processing written language. If you have dyslexia there is adult learning courses and support. Young people with (SEND) special educational needs and disabilities may wish to go into higher education there is support and courses available for students with disabilities who wish to study at University level. University of Greenwich have a dedicated Disability and Dyslexia team to help students at every stage. If you have a disability, impairment, specific learning difficulty, long term mental health issues e-mail: staart@gre.ac.uk to find out how you can get support. This is an accessibility project with a team focused on disability and diversity at the University of Greenwich. They provide information and guidance to disabled and diverse students who may not feel university is for them. The team started in 2007 and continues to develop to meet the needs of the disabled and diverse students. Going to University can be challenging for anyone as students go from a highly structured school or college environment to organising their own studies and social life. For students with disabilities these challenges can be more extensive so good preparation and organisation is important. With STAART, we support students through this transition. Fulfil your potential by studying with The Open University. World-leading distance learning that comes to you. The OU strives to make all aspects of study accessible to everyone, which is why more disabled students choose the OU than any other UK University. Last year we supported around 18,000 such students to achieve their study goals. Disabled Students Allowance provides extra financial help if you have a disability, mental health difficulty or medical condition. If you are a student with a disability, health problem or learning difficulty you can apply for Disabled Students Allowance. There are now lots of opportunities to move from education to work. For many young people work experience or a Saturday job is an option. Try to think of what you enjoy doing and see if there are any opportunities through school, colleges or through people you know. Taking first steps early enough can really help you to find out what sort of things interest you and what work is like. Your Prospects advisor (http://prospects.co.uk/ContactUs/CorporateHeadOffice/ProspectsinGreenwich.aspx ) or Disability Employment Adviser (http://www.jobcentreguide.co.uk/jobcentre-plus-guide/34/disability-employment-advisors) at the Job Centre Plus will help you look for the right sort of employment to suit you. We will be developing the Local Offer to include more services in Greenwich that will help you look for work so keep an eye on this page for updates! An Education, Health and Care (EHC) Plan is for anyone up to age 25 who needs additional support. EHC Plans identify educational, health and social needs and set out the additional support to meet those needs. https://www.preparingforadulthood.org.uk/downloads/employment/routes-into-work-guide.htm#What is this guide about? Apprenticeships allow young people to earn whilst they learn and study for nationally recognised qualifications. Apprentices learn while they work by doing a real job in a real workplace. You could also gain a National Vocational Qualification (NVQ). Traineeships provide young people with training to prepare them for their future career by helping them to become ‘work ready’, by giving them the skills and experience that employers are looking for. They include work preparation training, a high quality work experience placement and English and Maths for those who need it. Supported internships are for young people with complex needs aged 16 to 24 with a statement of Special Education Needs, a Learning Disability Assessment or an Education Health and Care plan who want to move into employment and require extra support to do so. Supported internships include on-the-job training with expert job coaches responsible for supporting both interns and their employers. These internships are unpaid and last for a minimum of six months. Wherever possible, they support the young person to move into paid employment at the end of the programme. Young people also complete a personalised study programme, with the chance to study for relevant substantial qualifications. Many young people like to volunteer and local opportunities can be found here: www.vcgreenwich.org.uk. Being a volunteer means giving you time to help other people. If you are a volunteer you will not get paid. This means you will be able to keep your benefits. If you would like to get a job after you volunteer, it’s important to find out how the people you volunteer with can help you. If you don't want to work for someone else you could start your own business. Having your own business or company is known as being self-employed. You must do all or most of the work yourself. You must decide what to do and how to do it. Evenbreak is a website designed to support individuals with disabilities to apply for work. This website advertises jobs including: apprenticeships, internships, voluntary work and work experience. The Disability Confident scheme has 3 levels that have been designed to support you on your Disability Confident journey. Employers must complete each level before moving on to the next. Work Choice helps you find, keep and progress in a job. The type of help you get depends on what you need - it’s different for everyone. You can get either getting into work support or in work support. People with a visual impairment may be entitled to Blind Person’s Allowance. This is an extra amount of tax free allowance that means you can earn more before you start paying Income Tax. People with visual impairment may be entitled to Blind Person’s Allowance. This is an extra amount of tax free allowance that means you can earn more before you start paying Income Tax. Some young adults will continue to live at home with their parents or carers. However, some young people will prefer to either get a place to live on their own, or to live with others. There are many types of property to choose from. This will depend on what you want, along with the type of support you need. Regarding independent living a personal budget is the route to achieving independent living based on the social model of disability. It assists disabled people to live an active life and participate in society. It enables you to achieve your outcomes stated in your personalising care and support planning. If you have a learning disability and are likely to require help in living more independently, you should request assessment of your needs. This is usually done by Royal Greenwich Community Learning Disability Team at cldtteamsupport@oxleas.nhs.uk or 020 8921 4860. Support can range from just a few hours a week to up to 24 hours of support per day. Supported tenancies cover a range of accommodation and adapted properties set up to enable people with learning or physical disabilities, or with sight or hearing loss, to live in their own home. These are usually shared by a small group of tenants with staff providing support with day to day living, from a few hours a day up to 24 hours. Help and support is also offered for setting up and maintaining a home, managing finances, claiming benefits and developing domestic and life skills. Residential placements provide accommodation for people with learning or physical disabilities who need more intensive or specialised support than can be provided at home. Different types of residential placements are available to meet individual needs and different levels of disability. Personal budgets can be one way of helping you pay for any support to live independently. Citizen’s Advice Bureau can help give you advice and information on your rights in rented, shared or housing association properties. What is being done locally to increase housing and support options for young people with SEND? The Point is the centre of youth support services in Royal Greenwich borough. Services for young people are based in one setting providing integrated help, advice and direction. These services include information and advice about education, employment, housing options, training, personal development programmes, sexual health, volunteering and positive activities, drug and alcohol support. Friendships, relationships and being part of the community may benefit young people it may improve their quality of life and enhance their personal satisfaction it is just as important as: education, getting a job, living independently and health. Young people with SEND may find it difficult to form friendships, relationships and generally being part of the community it maybe because of several underlying factors some of the reasons as to why maybe because they may not know how, they may feel lonely. There are a range of activities that young people can get involved in. This is one way to meet other people that have similar interests. The Local offer in Greenwich provides some of these activities. More information can be accessed via the local offer website or the Greenwich Directory. As you get older it is important to stay fit and look after yourself. In Greenwich there are a number of groups and services who support young people with their healthcare needs. This includes help and support from your local GP surgery, health centres. If you have a learning disability, poor mental health or physical health your GP will ask to see you once a year. The Annual Health Check scheme is for adults and young people aged 14 or above with learning disabilities that need more health support and may otherwise have health conditions that go undetected. What happens at Annual Health Check? The Annual Health Check lets the person with learning disabilities go to their GP practice and have aspects of their health checked. It also allows them to talk about anything that's worrying them. Over one million people in the UK have a learning disability but only 200,000 are on their GP’s Learning Disability Register. People with a learning disability often have difficulties accessing health services and face inequalities in the service they receive. The Government is asking parents and carers to speak to their GP and ensure their sons/daughters or the people for whom they care are registered. It is hoped that this drive will ensure better and more person centred health care for people with learning disabilities. Transitions regarding autistic individuals, there are many transitions throughout anyone’s life this could be: school, college or work change is difficult for anyone and for autistic individuals it could be even harder. Special school nurses provide holistic and focussed nursing care for children and young people, many with complex health needs, in their school. Special school nurses are based in the following schools.